The Global Leadership Initiative (GLI) is led by a group of academic researchers and students who attend, monitor and conduct real time policy analysis at major global summits such as the Group of Seven (G7), the Group of Twenty (G20), the International Labor Organisation’s Governing Body meeting (ILO), the International Land Coalition’s Biennial Global Forum, The Architecture Sans Frontières’s International General Assembly meeting (ASF) and others. The GLI publishes small articles and blogs that offer credible academic analysis of global summits and their implications for global politics. In particular, the GLI focuses on the furtherance of needed leadership (or lack thereof), holding world leaders to account, but also stressing new opportunities and past successes. The GLI is based within the Faculty of Social Sciences at the University of Sheffield and was first initiated by academics from the Department of Politics and the School of East Asian Studies who attended the 2013 G20 summit in St Petersburg and discovered that there was a significant gap in informed analysis of the topics under discussion. Academic experts and student policy analysts were therefore sought out to provide media briefs and to clarify policy issues. To fill this gap, the GLI seeks to fulfill two aims.First, the GLI provides up-to-date and real time policy analysis of global decision-making at the highest level, holding global leaders to account. Second, the GLI offers an exciting opportunity for high achieving students (undergraduates and taught postgraduates) from the Faculty to attend summits and to collaborate with academic researchers. This is an opportunity for students to gain first-hand experience in international policy debates, to attend press conferences and to produce outputs visible to an international audience thereby enhancing their research skills and employability. The 44th G7 is taking place in Charlevoix, Canada. It focuses on: 1) investing in growth that works for everyone; 2) preparing for jobs of the future; 3) advancing gender equality and women’s empowerment; 4) working together on climate change, oceans and clean energy; and 5) building a more peaceful and secure world. 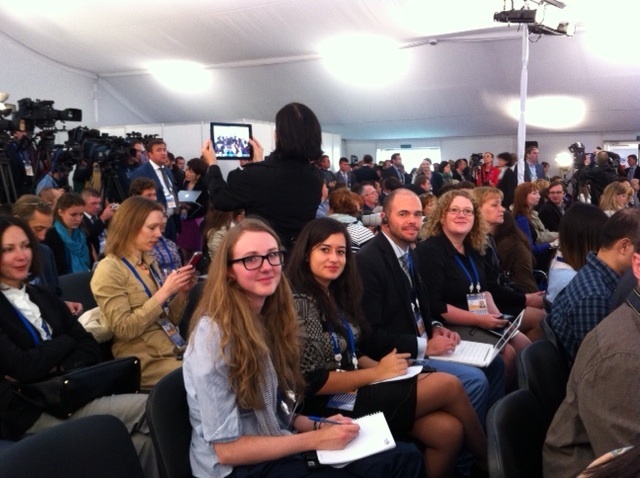 This year's GLI team will be reporting from the International Media Centre in Quebec City throughout the summit.